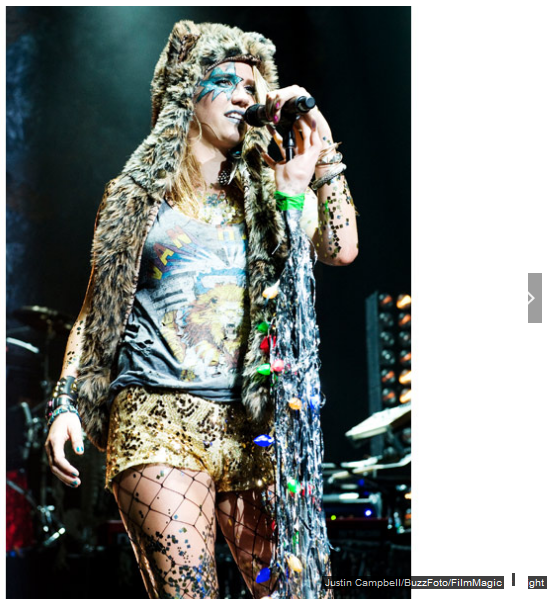 Known for feathers, fur, and bathing in glitter, Ke$ha has walked the red carpet in all kinds of crazy outfits during her career. See her 10 most outrageous looks here. Ke$ha attends KIIS FM's Wango Tango Concert at the Staples Center on May 15, 2010 wearing a too-short mini dress complete with feathers and the season's hottest accessory: a mannequin head. Ke$ha arrives on the red carpet of the 21st Annual MuchMusic Video Awards in Toronto on June 20, 2010 with a staff that would be better suited for performing voodoo incantations than pop songs. At the June 2011 Wireless Festival in London, we learned what Ke$ha is really made of: bones, dollar signs, and a whole lot of glitter. Ke$ha looked gorgeous in this periwinkle glitter and taffeta gown, but she definitely didn't look happy. Hiding behind tousled blonde waves at the 2011 Billboard Music Awards was a very gloomy-looking pop star. During her showing at the Bud Light Hotel event (with performances by Nelly and Pitbull) on February 5, 2011 in Dallas, Texas, the pop star carefully covered up her shredded outfit with a just-big-enough sampling machine. It's not the lace-less boots or purple feathered coat that makes this one of Ke$ha's most outrageous looks -- it's the fake hair she's wearing at Rolling Stone's 2010 AMA afterparty in Los Angeles. We'd like to nominate this one for the World's Craziest Mullet competition. Ke$ha arrives at the 2010 American Music Awards in Los Angeles draped in a dress that brings to mind one of music's nearly-forgotten relics: the cassette tape. Emphasis on the "tape," strips of which are accenting her outfit. Ke$ha is probably the only person in the world who can get away with a green bathing suit and painted body on the red carpet. And she did just that in 2010, posing with her Best New Act award at the MTV EMAs in Madrid, Spain. When your hair is longer than your dress, you know it’s going to be an interesting night. Ke$ha poses at the 2010 MTV Video Music Awards in L.A.
Ke$ha shows her support for (fake) fur by wearing half of a synthetic bear at Casio's Shock the World 2010 press event on August 2, 2010 in New York City.